The agreement is valid for three years. A former deputy head of Ukrainian ex-President Viktor Yanukovych's administration, Andriy Portnov, who has been hiding in Russia since 2014, has said that he has taken control of NewsOne TV. "Let me inform you that two days ago [27 August] in Vienna I signed an agreement on the management of the NewsOne TV channel," he said on Facebook. Portnov said he took over the reins for three years from the owner of the company's statutory fund, Volodymyr Murayev, the father of pro-Russian MP Yevhen Murayev. Under the agreement, the owner cannot interfere in the work of the channel or terminate the agreement unilaterally, Portnov said. He will also have preferential buyout rights if the channel is put for sale. MP Murayev confirmed the deal with Portnov whom he described a "well-known lawyer and simply a good person with whom we see the world in a similar artistic way". On 7 June, Murayev described Ukrainian filmdirector Oleh Sentsov sentenced in Russia as a "terrorist" and accused him of plotting "arsons and explosions". His remarks caused a backlash in Ukraine. The Prosecutor-General's Office opened a case against him on high treason charges. During Yanukovych's rule, Portnov was a deputy head of his administration and took part in the development of the so-called "dictatorship laws". 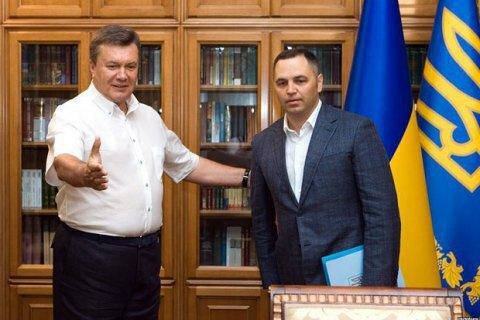 The transcripts of phone conversations of Russian presidential adviser Sergey Glazyev, which were unsealed in February 2018, suggest Portnov's possible involvement in the occupation of Crimea by Russia. In March, the Security Service of Ukraine (SBU) opened a high treason case against Portnov. As reported earlier, the popular news-based 112 Ukrayina TV changed hands in August. According to the Schemes investigative journalist group, its new owner is Eduard Katz who is in fact acting in the interest of pro-Russian politician Viktor Medvedchuk, who is believed to be close to Vladimir Putin.